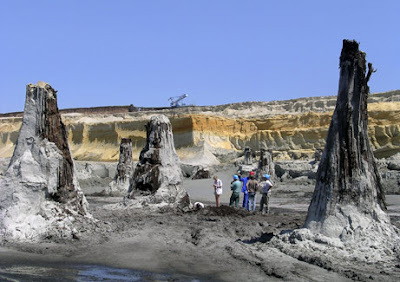 Miners digging for lignite, a type of coal, discovered a patch of cypress forest that's eight million years old. The palaeontological site is in Bukkabrany in northeastern Hungary, and it has been luring scientists because of the perfect preservation of the wood of the trees, which, logic would dictate, should have been petrified after so long. The state of the trees may give climatologists clues to what happened to the region at that time, when the Pannonian lake, which submerged much of Hungary began to retreat and caused much of the Mediterranean sea to dry up.